All coaches and managers should know the various health and safety policies and also our club’s Codes of Conduct and fair treatment policy. AT ALL TIMES WHILST THEY ARE IN YOUR CARE, PLEASE ENSURE THAT THE CHILDREN ARE WELL SUPERVISED AND THAT ALL ASPECTS OF THEIR SAFETY HAVE BEEN PROPERLY CONSIDERED. Generally, if you can’t see them or if they’re too far away to easily hear you then they’re not in the right place. You should be particularly alert to this at the end of training or a game as this is always a busy time. Children should wait with or near the group while they’re waiting to be collected. It is not appropriate for them to be waiting unsupervised in car parks (like at Seaforth Oval) or near roads. You should not allow a player with an injury to take the field or continue playing if by doing so the player could be at risk of further injury. Whenever a player plays in an older age group, the coach and the parents must assess the risk of that player being injured by older players who may be bigger and more aggressive in tackles. FNSW requires that players wishing to play in an age group more than two years older than their level (eg. a very capable U11 wishing to play with their older sibling in U14s) must complete a FNSW Playing Above Age Consent Form to acknowledge the risks involved and must obtain approval from the MWFA before playing. Let the parents know about these issues – their help and understanding will make your life easier. Stop play if the time between seeing a lightning flash and hearing thunder is less than 30 seconds. Immediately seek safety under appropriate shelter. Do not resume play until at least 30 minutes has passed since the last thunder was heard. Click HERE for the full FNSW rule. For U18 and over .. cancel or postpone events at a temperature of 37°. For ages below 18 .. cancel or postpone events at a temperature of 32°. Cancellation of games, training or events at lower temperatures may be necessary depending on local conditions and player well being. Click HERE for the full FNSW policy. Actively promote sun safety and the importance of sun safety when the UV Index is 3 and above. Smoking by players is banned for the duration of the match. Smoking by officials, players, referees and volunteers is banned in access ways to and from the field of play, technical areas and change rooms. All items of jewellery are strictly forbidden and must be removed. Players are not allowed to play in a cast, whether it be plaster, fibreglass, or any other rigid material. Covering hard casts with foam or soft materials is also not acceptable. Allow nothing more solid than a bandage. The Hijab or headscarf may be worn by female players. Referees are not permitted to check the affixing of the Hijab and under no circumstances touch the garment. The goalposts must not be used unless they are stable and safe for use. Pregnant players should always seek advice from an appropriately qualified medical practitioner as to the risks involved in participating in football and related activities while pregnant and whether it is safe for them to continue participating in football while pregnant and, if so, for how long should they continue to participate. Hard surfaces of the glasses must be wholly plastic. The glasses, when worn during play, must be firmly secured to the head. Click HERE for the full MWFRA policy. FFA and FNSW recommend following the guidelines which are set out in the nationally adopted Play by the Rules program and which were developed by the Australian Sports Commission. The guidelines state that it is acceptable for people to take photos or videos of children at sporting events for the usual reasons, for example a parent videoing their child at a sports presentation, or photographing their child on the field during play, or a professional photographer taking photos for a club, or for the purpose of analysing and improving performance. However they must not intend to publish or display the video more widely, to others outside the team. If you believe that someone is not filming for acceptable reasons or that they intend to display the images to anyone beyond their team and coaches, then they should obtain your permission before filming. You are quite entitled to inquire about this before they film and if the answer is that they do intend to display the images anywhere else – eg. on a personal blog, a club website, promotional material of some kind, etc, then if you are unhappy with this then you are entitled to demand that they do not film. Click HERE for the Play by the Rules guidelines. The Seaforth FC Code of Conduct for Coaches sets out the standards of behaviour that we expect at all times from our coaches. All team coaches should read the code. All coaches are also subject to the FFA’s National Code of Conduct and National Spectator Code of Behaviour. The club and the MWFA have disciplinary groups that may counsel or sanction any member, parent or supporter who breaches any of these codes. 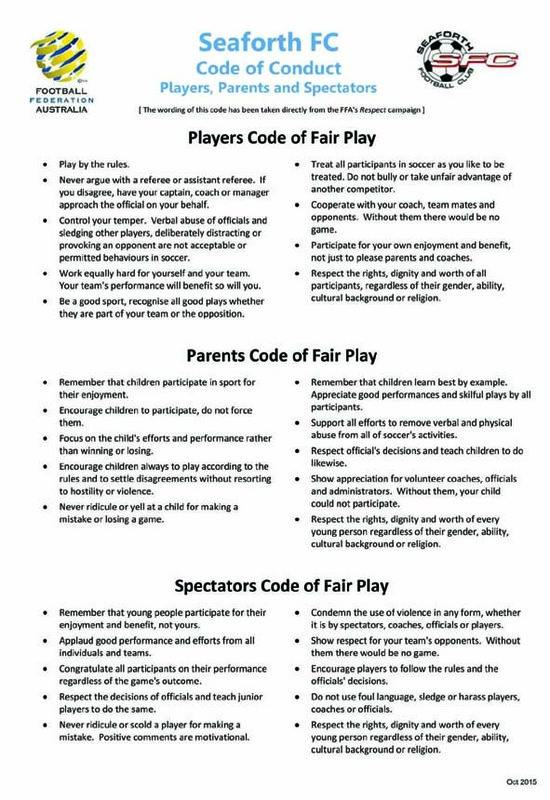 The Seaforth FC Code of Conduct for Players, Parents & Spectators sets out the standards of behaviour that we expect at all times from our members. 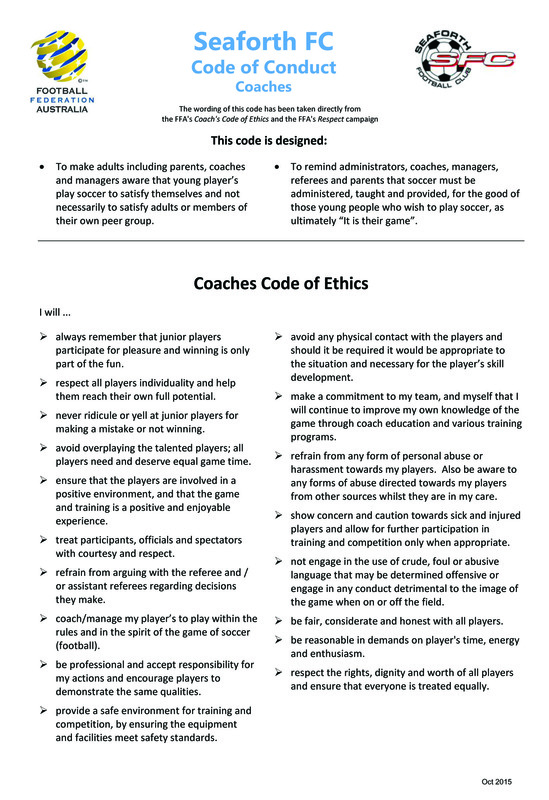 All players from U12 up and their parents and all team managers should read the code. For all U6 to U11 players, it would be very helpful if their parents could please take a moment every season to remind them of the importance of sportsmanlike behaviour. All team players, parents and supporters are also subject to the FFA’s National Code of Conduct and National Spectator Code of Behaviour. For all Seaforth FC Junior and Youth teams from U6s through to U16s, during the regular season, over any 4 week period, all players should be given equal game time on the field and should have equal opportunity of being in the starting line-up irrespective of ability. The team Coach and Manager should ensure that all players are treated equally and fairly within the team. Seaforth FC also supports the “need to borrow” principle defined in the MWFA Playing Rules which bans teams from borrowing stronger players from other teams if this results in regular team members playing less than half a game. The exception to this rule is a goalkeeper being borrowed due to injury of the team’s regular goalkeeper. Guidelines: We recognise that it is not easy for coaches to manage equal game time so we have developed some guidelines to allow parents, players and coaches to all have the same understanding of how the club expects this policy should be applied. We’re currently finalising these guidelines and will have them ready soon. Seaforth FC has one other football related policy promoting fair and equal treatment during team selection for Junior and Youth teams. The club will not intentionally oversubscribe registrations with the intention of selecting the stronger players and forcing weaker players to deregister in order to reduce the number of players in teams down to a workable number.